Judith W. Andrucki, A specialist in family law and litigation, received her J.D. from the University of Maine School of Law in 1979 and practiced with the firm of Marshall, Raymond and Beliveau, as well as its successor firm, Isaacson & Raymond, until she formed her own firm of Hark Andrucki. In 1999 Hark Andrucki merged with Troubh Heisler where she practiced until July 2007 when she opened The Law Offices of Judith W. Andrucki. She is now the managing partner of Andrucki & King, Attorneys at Law. In 1991, in addition to practicing law, Judith supervised the Family Law Clinic and taught Family Law and Evidence at the University of Maine School of Law. She is a member of the Family Law Section of the Maine Bar Association and has presented numerous Continuing Legal Education programs on issues concerning the litigation of custody disputes, alternate dispute resolution and mediation, the role of the Guardian ad Litem, and the determination of employability and income capacity. In 1997, Governor Angus King appointed Judith to serve on the University of Maine System Board of Trustees where she served two full terms, concluding in 2007. Judith also serves as a mediator and referee with respect to family law disputes. 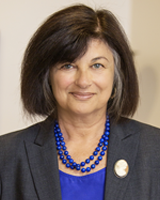 Judith currently serves on the Board of Directors of St. Mary’s Health System and the Maine Music Society. In addition, she serves on the Judicial Evaluation Committee of the Maine Bar Association and on the Friends of Pettingill Park. Judith is especially well known among her peers for her professionalism and ethics, earning an AV Preeminent Peer Review Rating by Martindale-Hubbell, the highest recognition possible in the legal industry. Andrucki and King was formed out of a desire to create a law firm dedicated to the practice of family law, sharing the belief that family law cases, like families are unique and require skill and attention. We have now expanded our practice to include seasoned attorneys representing clients in civil and criminal matters in both State and Federal courts. Our experienced attorneys work closely with our clients to ensure the same detailed and attentive approach to each client we represent in every type of matter.